In poems that are at times both achingly serene and beautifully complex, Carrie Seitzinger’s Fall Ill Medicine reminds us of the spaces between the moments we pay attention to, in a world gone mad. Each poem offers the reader a chance to remember, an opportunity to forget, and at the very least, a reason to consider the things that make us fragile humans. Just as the poet wonders “why it is never explained that the simplest trick for the magician to do is disappear,” so too — you will wonder again and again at the thoughts and moments that have slipped from your memory, and how much a part of you they still are. 1st Printing: Small Doggies Press 2012. *If you are ordering from Canada, UK, Europe or anywhere outside the U.S., please contact us first before ordering. *Book is $10.95 + $2.50 shipping and handling. 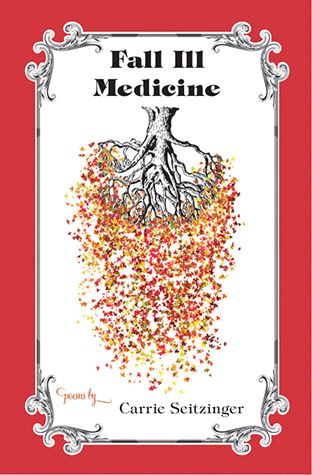 Fall Ill Medicine is a book of poems that brings one back to body’s story – with a brutal pull soft as moth’s wings. There is a lovestory that exists in between objects and silences and ribs. There is a lifestory that makes strength from our frailties. Carrie Seitzinger sings the body home. In Carrie Seitzinger’s collection Fall Ill Medicine we are healed. Seitzinger is a doctor of the lyric moment, a humanist of narrative, and has the bedside manner any poet would be lucky to have—that is a verse filled with truth, mystery, and kinetic energy. As she writes in her poem Freefall Flight “Then I walk to the window and fall out. / And it is beautiful and I am happy.” And so we are lucky to walk into the windows of her poems, and through the fall made beautiful and happy. Fall Ill Medicine honors its title completely. It’s a literary safe house for the ravaged heart. If these poems are ever recorded, they should only be put on vinyl.